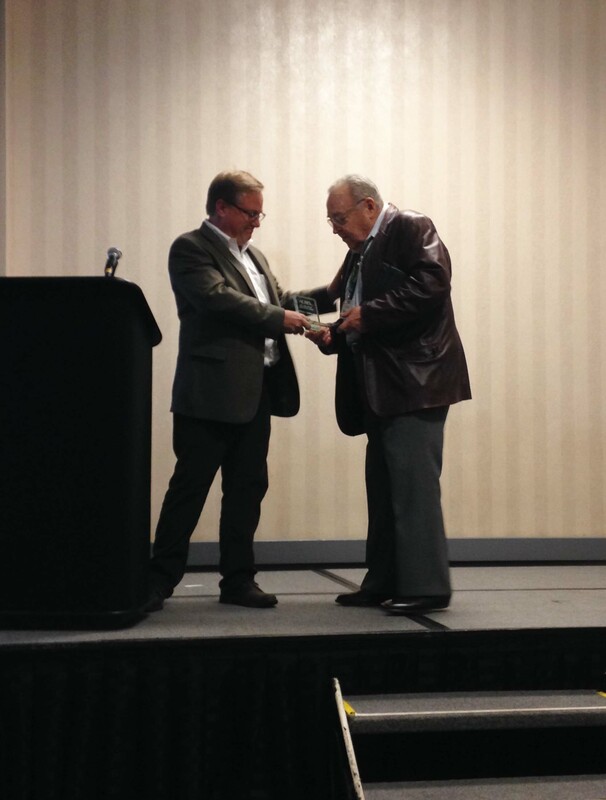 Tuesday, December 23, 2014 - Osco, IL - Waukon, Iowa veterinarian, Richard “Doc” Holliday, was presented with the AcresUSA Eco-agriculture Achievement Award at the 2014 AcresUSA Conference and Trade Show held in Columbus, Ohio in early December. This award, presented yearly to an exceptional leader in the eco-agricultural community, honors “Doc” Holliday for his over fifty years of work in the alternative veterinary and holistic agricultural communities. A 1959 graduate of the University of Missouri College of Veterinary Medicine, Doc studied relationships between animal health and soil fertility under William Albrecht before entering into private mixed practice in northwest Missouri. It was during this time that Doc Holliday began to explore the concepts of feeding self-regulated individual minerals to animals. Always one to push the envelope, and continually learning, in 1988 Doc became one of the first certified veterinary acupuncturists and served as the president of the International Veterinary Acupuncture Association from 1992-1994. Continuing to be active in his eighth decade, Doc works as the senior veterinary consultant for Advanced Biological Concepts, based in Osco, Illinois. Doc Holliday was lured to the stage at an evening session at the 2014 AcresUSA meeting on the guise of recognizing him for the publication of his new book, A Holistic Vet’s Prescription for a Healthy Herd, co-authored with the late Jim Helfter and published in December by Acres. Once he was on stage, the assembled group recognized Doc as an inspirational leader in the agricultural community who had dedicated his life to the betterment of man and beast and who generously and freely shares his knowledge and experience with others - supporting and encouraging better, healthier farming and animal husbandry practices. Advanced Biological Concepts®, a company founded by Jim Helfter over forty years ago, is dedicated to providing livestock producers with nutritional technology to achieve maximum animal health from the production of drug and hormone-free meat and milk. Jim’s years of hands-on experience taught him that animal health issues are due to nutritional deficiencies from single source diets and related environmental conditions such as confinement. Since Jim’s death in October of 2014, the company’s mission, “Improve the quality of life for mankind by improving the quality of life for animals through nutrition” continues through the ongoing work of the experienced and dedicated staff at Advanced Biological Concepts®. Acres USA is North America’s largest publisher on production-scale organic and sustainable farming. For more than four decades, Acres’ mission has been to help farmers, ranchers and market gardeners grow food organically, sustainably, without toxic harmful chemistry. “To be economical agriculture must be ecological.” Charles Walters, Acres U.S.A. founding editor/publisher, writing in 1970.